The Global Nutrition Report 2018 was recently released. This report was produced by the Independent Expert Group, of which African Centre for Cities senior researcher Dr Jane Battersby is a member, supported by the Global Nutrition Report Stakeholder Group and the Secretariat at Development Initiatives. 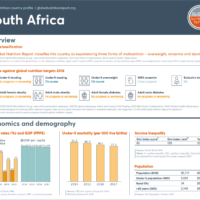 View report sections and country profiles online.